Mumdouh is an Associate at ArzanVC. His role at AVC consists of overlooking the investment cycle- focusing on due diligence, valuation, business plan analysis, executing transactions, analyzing interesting industry subsectors, and helping out portfolio companies. He has previous placement experience with PwC and KMPG and training from regional Investment Banks. He previously co-founded an organization that is responsible for educating and providing sustainable help for 300+ Syrian refugee children in bordering Turkey. 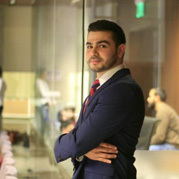 Mumdouh graduated from the American University of Beirut (AUB) with double concentration in Finance and Decision Systems (Data Analytics).